This Sunday morning we will have a time of prayer in our services as we send of Jade Landis (OBI Philippines) and another team to Haiti. From July 12-19, 11 people from Grace Church will travel to Cap Haitian, Haiti, to visit the House of Hope (HOH) orphanage. Grace Church has been active with the children at HOH for several years: Many of the children are sponsored, individually, by Grace Church attenders; Grace Church has sponsored several building and development projects; and Grace Church has previously ministered at HOH through Vacation Bible School. This summer’s trip is a mix of several initiatives. First, several members of our team will get to spend time with children they sponsor, individually. The opportunity to have face-to-face interaction with sponsored children is a real treat and blessing! Many people have orphan sponsors in places in the world that are impossible or very difficult to get to, so the orphan-sponsor relationship is limited to occasional mailings. Any bit of relationship is really precious, but human contact is incredibly special for both the sponsored child and the sponsor. The team will also be throwing a birthday bash for all the orphans. As orphans, many of the children at HOH have no idea when their birthday is, and have had to guess about how old they are! So our team is determined to give them a celebration like none other, complete with special birthday treats, and gifts! It will be an awesome celebration! The team’s main project will be a sort of “Vacation Bible School” for the children. 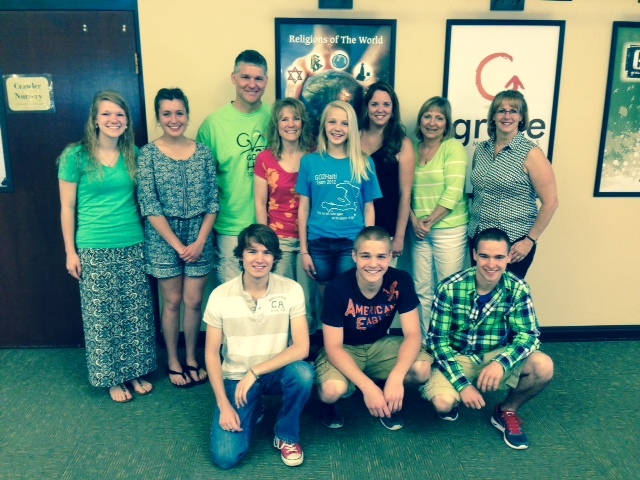 This year, the team will really be focusing on discipleship “beyond” the one week visit from Grace Church. In other words, the team will work to equip the children to continue to growing spiritually after the team is gone. Eventually, we hope to actually train the children how to put on a VBS program that they can use to reach people in their community and beyond. In addition to these projects, the team has committed to providing Creole Bibles to each of the children and the staff at the orphanage! These will be purchased in Haiti and wrapped in wrapping paper – presented to them at the birthday celebration! Would you consider partnering with this team? PRAY: Commit to praying for this team daily as they prepare and go! We’ll provide you with a helpful prayer card this week at church! GIVE: The team still has a financial need! Between team needs, and the Bible project, the team needs approximately $5,000 yet. If you’re able, please consider giving to this team by marking your gift “Haiti team” or through online giving HERE. You may have seen in the news recently that there is a virus making its way through the Caribbean that is carried by mosquitoes. Please pray for special protection for our team as they travel – they will be prepared to use precautionary measures (like mosquito nets and heavy-duty bug spray). In addition, be in prayer for the orphans and churches in Cap Haitian – many of whom have already been hit by this illness. It comes with a lot of joint pain.